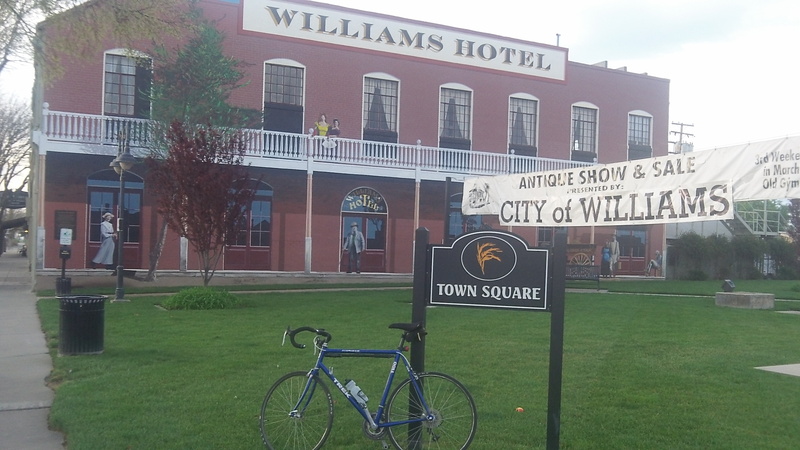 Part of the fun of taking a road trip is in stopping in the towns along the way and taking a look around. I did that a couple of days ago in Williams, a town about halfway between Sacramento and Redding in the Sacramento Valley. It was Sunday morning, and not many people were out and about. But my impression is that it’s a friendly town. When I on a bike and a guy in a pickup both arrived at a four-way stop from different directions, he waved me through ahead of him, with a smile, and I acknowledged his kindness with a wave of my own. See how little things can leave an impression far beyond their actual significance? Spanning E Street, big sign lets you know where you’ve arrived. A mural makes the old Williams Hotel look real and new. 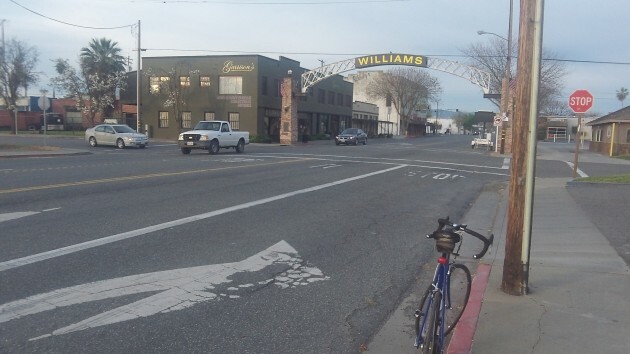 When we travel down I-5, we generally stop in Williams to eat. There is a wonderful restaurant/deli there named Granzellas, which specializes in olives — all sorts and flavors of olives. We will pick up large jar (about half a gallon size I think) it’s a tough decision as they are all so good. The olives last a long time once we get them home. Did you by chance go into Granzellas? Great tip. Their green olives stuffed with jalapeno’s are my favorite. Just don’t eat too many lest you suffer on the “southern end” the following day!